CEKLI, S. , UZUNOGLU, C. P. , UGUR, M.
Pressboards are commonly used as insulating materials employed in electrical connections of transformers. Pressboards are typically made from vegetable fibers, which contain cellulose. The proper operation of power transformer depends mainly on constant monitoring of insulation materials against failure. Due to the complex and close structure of power transformers, it is very challenging task to detect failure and hence possible location of degradation of pressboard internally. Generated discharge signals may result in breakdown of system insulation and system failure. In this study, the investigation of insulation degradation is fulfilled by analyzing discharge signals and simultaneously produced acoustic signals during discharges. For this purpose, a test setup is used for investigating discharge signals of pressboard samples under different electrical stresses. This paper proposes monofractal and multifractal analysis of discharge and acoustic signals of pressboards. The Higuchi's method is an effective monofractal analysis tool for measurement of fractal dimension of self-affine signals, which is proposed for online monitoring of discharge signals of pressboards. In order to investigate obtained discharge signals with accelerated fluctuations effectively, multifractal detrended fluctuation analysis is proposed for these signals, which exhibit nonlinear behavior. X. Yi, Z.D. Wang, "Creepage discharge on pressboards in synthetic and natural ester transformer liquids under ac stress," IET Electric Power Applications, vol. 7, no. 3, pp. 191-198, 2013. L. VaraÄka, J. KÃºdelÄÃ­k, M. Gutten, "Dielectric frequency response of mineral oil impregnated pressboard," International Scientific Conference on Electric Power Engineering (EPE), Kouty nad Desnou, 2015, pp. 662-665. H. P. Mosser, V. Dahinden, Transformerboard II. H.Weidman AG, CH-8640 Rapperswil, pp. 137-144, 1987. X. Yi, Z.D. Wang, "Surface Tracking on Pressboard in Natural and Synthetic Transformer Liquids under AC Stress," IEEE Trans. Dielectr. Electr. Insul., vol. 20, no. 5, pp. 1625-1634, 2013. B. Duan, Y. Cheng, H. Bai, C. Cheng, "A method for on-line monitoring of electric tree growth in pressboard of transformers," IEEE International Conference on High Voltage Engineering and Application (ICHVE), Chengdu, China, pp. 1-4, 2016. C. J. Diao, Y. C. Cheng, et al., "Contrast of the Developing Regularity of Partial Discharge of Oil-paper Insulation Using Step-stress Test and Constant Stress Test," IET High Voltage Engineering, vol. 39, no. 2, pp. 365-373, 2013. J. Zhou, J. Li, R. Liao, Y. Lv, "Thermal aging properties of pressboard in mineral oil and natural ester," 2016 IEEE International Conference on High Voltage Engineering and Application (ICHVE), Chengdu, pp. 1-4, 2016. C. J. Diao, Y. C. Cheng, et al., "Developing Laws and Severity Diagnosis of Partial Discharge Defects on Oil-paper Insulation," IET High Voltage Engineering, vol. 39, no. 5, pp.1061-1068, 2014. J. Li, W. Si, X. Yao, Y. Li, "Partial discharge characteristics over differently aged oil/pressboard interfaces," IEEE Transactions on Dielectrics and Electrical Insulation, vol. 16, no. 6, pp. 1640-1647, 2009. B. Qi, C. Gao, X. Zhao, C. Li, H. Wu, "Interface charge polarity effect based analysis model for electric field in oil-pressboard insulation under DC voltage," IEEE Transactions on Dielectrics and Electrical Insulation, vol. 23, no. 5, pp. 2704-2711, 2016. H. Okubo, T. Sakai, T. Furuyashiki, K. Takabayashi, K. Kato, "HVDC electric field control by pressboard arrangement in oil-pressboard composite electrical insulation systems," IEEE Conference on Electrical Insulation and Dielectric Phenomena (CEIDP), Toronto, pp. 35-39, 2016. F. A. Khan, J. S. Rajan, M. Z. A. Ansari, D. Sivan, "Effects of dibenzyl disulfide on pressboard," IET Chennai 3rd International on Sustainable Energy and Intelligent Systems, Tiruchengode, pp. 1-5, 2012. P. M. Mitchinson, P. L. Lewin, B. D. Strawbridge, P. Jarman, "Tracking and Surface Discharge at the Oil-Pressboard Interface," IEEE Electr. Insul. Mag, vol. 26, no. 2, pp. 35-41, 2010. S. Okabe, G. Ueta, H. Wada, H. Okubo, "PD-induced Degradation Characteristics of Oil-impregnated Insulating Material Used in Oil-immersed Power Transformers," IEEE Transactions on Dielectrics and Electrical Insulation, vol. 17, no. 4, pp. 1225-1238, 2010. H. B. H. Sitorus, A. Beroual, R. Setiabudy, S. Bismo, "Creeping discharges over pressboard immersed in jatropha curcas methyl ester and mineral oils," IEEE 11th International Conference on the Properties and Applications of Dielectric Materials (ICPADM), Sydney, pp. 152-155, 2015. B. Mandelbrot, The Fractal Geometry of Nature. Freeman and Co., New York, 1983. P. A. Burrough, "Fractal dimensions of landscapes and other environmental data," Nature,1 vol. 294, pp.240-242, 1981. C.P. UzunoÄlu, M. UÄur, A. Kuntman, Simulation of Chaotic Surface Tracking On The Polymeric Insulators With Brownian Motion, Istanbul University - Journal of Electrical & Electronics Engineering, vol.8, no.1, 2008, pp.585-592. H. G. E. Hentschel, I. Procaccia, "The infinite number of generalized dimensions of fractals and strange attractors," Physica D: Nonlinear Phenomena, vol. 8, no. 3, pp.435-444, 1983. J. Theiler, "Estimating fractal dimension," Journal of the Optical Society of America, vol. 7, no. 6, pp.1055-1073, 1990. H. Takayasu, Fractals in the Physical Sciences. Manchester University Press, Manchester, 1990. P. L. Curto-Risso, A. Medina, A. C. HernÃ¡ndez, L. Guzman-Vargas, F. Angulo-Brown, "Monofractal and multifractal analysis of simulated heat release fluctuations in a spark ignition heat engine," Physica A: Statistical Mechanics and its Applications, vol. 389, no .24, pp. 5662-5670, 2010. T. Higuchi, "Approach to an irregular time series on the basis of the fractal theory," Physica D: Nonlinear Phenomena, vol. 31, no. 2, pp. 277-283, 1988. C. GÃ³mez, A. Mediavilla, R. Hornero, D. AbÃ¡solo, A. FernÃ¡ndez, "Use of the Higuchi's fractal dimension for the analysis of MEG recordings from Alzheimer's disease patients," Med. Eng. Phys, vol. 31, no. 3, pp.306-313, 2009. S. KesiÄ, S. Z. SpasiÄ, "Application of Higuchi's fractal dimension from basic to clinical neurophysiology: A review," Computer Methods and Programs in Biomedicine, vol. 133, pp.55-70, 2016. C. F. Vega, J. Noel, "Parameters analyzed of Higuchi's fractal dimension for EEG brain signals," Signal Processing Symposium (SPSympo), Debe, pp.1-5, 2015. J. W. Kantelhardt, S. A Zschiegner, E. Koschielny-Bunde, S. Havlin, A. Bunde, H. E. Stanley, "Multifractal detrended fluctuation analysis of nonstationary time series," Phys. A, vol. 316, pp.87-114, 2002. N. M. Lau, C. S. Choy, D. H. Chow, "Identifying Multifractality Structure on Postural Sway," Journal of Ergonomics, vol. 15, no. 2, 2015. R. Krishnam, et al., "Detrended fluctuation analysis: a suitable long-term measure of HRV signals in children with sleep disordered breathing," In: Engineering in Medicine and Biology Society, IEEE-EMBS, pp.1174-1177, 2006. 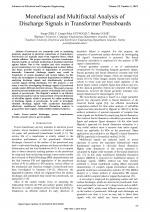 M. Bachmann, A. Suhhova, J. Lass, K. Aadamsoo, U. VÃµhma, H. Hinrikus, "Detrended fluctuation analysis of EEG in depression," In XIII Mediterranean Conference on Medical and Biological Engineering and Computing, pp.694-697, 2014. S. Kimiagar, et al., "Fractal analysis of discharge current fluctuations," Journal of Statistical Mechanics: Theory and Experiment, vol. 3, pp.3-20, 2009. M. El Bari, M. Ruef, M. Renaud, P. Francois, "Drying of Transformer Board," Drying Technology, vol. 14, no. (3-4), pp.825-839, 1996. L. E. Lundgaard "Partial discharge. XIII. Acoustic partial discharge detection-fundamental considerations," IEEE Electrical Insulation Magazine, vol. 8, no. 4, pp.25-31, 1992. P. J. Moore, I. E. Portugues, I. A. Glover, "Radiometric location of partial discharge sources on energized high-voltage plant," IEEE Transactions on Power Delivery, vol. 20, no. 3, pp.2264-2272, 2005. K. Raja T. Floribert, "Comparative investigations on UHF and acoustic PD detection sensitivity in transformers," IEEE International Symposium on Electrical Insulation, Boston, MA, pp.150-153, 2002. A. Anier, T. Lipping, S. Melto, S. Hovilehto, "Higuchi fractal dimension and spectral entropy as measures of depth of sedation in intensive care unit," Engineering in Medicine and Biology Society, vol. 1, pp.526-529, 2004. Citations for references updated on 2019-04-22 02:43 in 221 seconds. Website conception, design and maintenance by Eugen COCA. Content updated on 28 Feb 2019. Site engine updated on 28 Feb 2019. This page was generated on the server in 0.081 seconds and loaded in your browser in > seconds.